The streaming API doesn't guarantee durability and reliable delivery of change data messages to the streaming client. • When a client first subscribes or reconnects, it doesn't get messages that were processed while it was not subscribed to the channel. • If a client disconnects and starts a new handshake, it may be working with a different application server, so it receives only new messages from that point on. • Some events may be dropped if the system is being heavily used. • If an application server is stopped, all the messages being processed but not yet sent are lost. The idea: Fix this and implement reliable messaging over the Streaming API between SFDC and the client. Just was looking to post this type of idea, glad to see it's already here! Couldn't agree more. 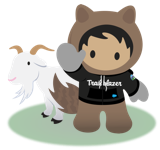 Currently I'm looking to replicate a Salesforce object in near real-time down to a local on-prem system (a call center), so the application can work off the local data store primarily, thus reducing inbound REST API traffic. However, for all the reasons Thomas mentioned, this isn't a bullet-proof solution. Probably to the point that we'll have to do something else at the moment. I'd really love to be able to use the Streaming API for this use case!